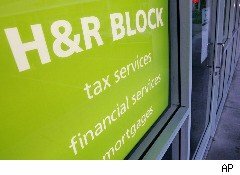 Tax preparer H&R Block (HRB) announced a change in leadership on Wednesday as Russ Smyth left his post as president and CEO to head a private company in Chicago. Alan Bennett was elected president and CEO by the company board of directors. Investors reacted negatively on the news of the CEO departure, as shares of H&R Block fell as low as $13.55 in early morning trading before recovering to $14.26, or down 8% by noon. Bennett, who had previously served as interim CEO of H&R Block from November 2007 to August 2008, will continue to serve on the company's board. He's credited with making some astute moves during his previous tenure as CEO, including moving the company out of the mortgage business and acquiring a key competitor in the Southwest. After losing market share to main rival Intuit (INTU), which has capitalized on the popularity of online tax-preparation software, Bennett is faced with helping Block compete more effectively as that market continues to change. He'll also have to rebuild a top-notch management team after Chief Financial Officer Becky Shulman and General Counsel Brian Woram left earlier this year. A Positive or a Negative? In a statement, H&R Block Chairman Richard C. Breeden expressed confidence in Bennett's ability to lead the company effectively and improve performance. "The company is in a very strong financial position today, but we recognize the need to accelerate efforts to create value for our shareholders," said Breeden. Analysts are undecided on whether the change in leadership will help or hurt. Barron's reports that an Macquarie Securities analyst believes losing Smyth is a serious blow to H&R Block, while the Associated Press quotes an Oppenheimer analyst saying an new executive team "could invigorate" the stock's performance.